In the next few blogs, I’m sharing discussions on some of the key gentle life topics that get bought up – in conversation, in groups, with clients, friends and the like. In this first one, I had taken inspiration from the recent discussions within my Gentle Life Members Hub where I challenged the group to a week of change in their digital habits. We started with this technique on day one and I wanted to share it wider because it has such a profound impact on the group. 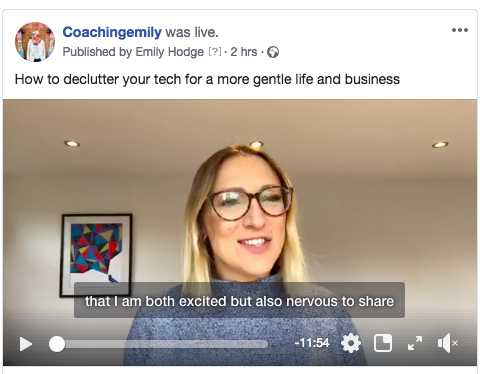 How to declutter your tech for a more gentle life and business is now available and you can watch (or listen) to the video here. I’ll let you know this too – as I say at the start – I was really nervous to share this, because I’ve been worried about judgement that sharing a message about using tech or social media differently or less whilst ON social media feels almost icky. Yet for that reason it is important to share there, because otherwise I’m not talking about some really big issues that impact SO many of us, that prevent us from feeling happier, clearer, calmer – more gentle! I hope you enjoy it and are able to take even a small action from the 3 ways to declutter that I talk about. You can now also join my latest challenge supporting leaders and influencers to lead more gentle and successful lives to enable you to mindset shifts that help you in your business and home life alike.